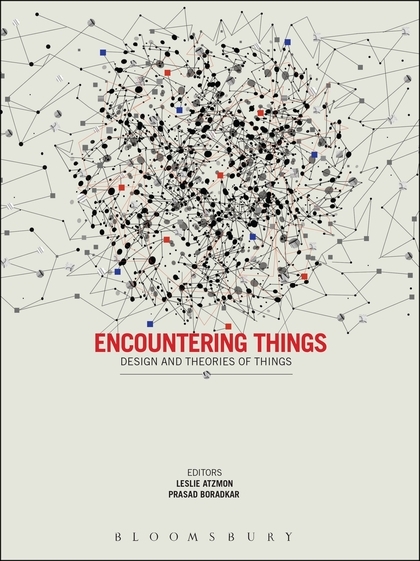 Encountering Things: Design and Theories of Things, edited by Leslie Atzmon & Prasad Boradkar, Bloomsbury 2017. Recently, the field of cultural studies has turned much of its attention to physical things—not just how they are used, but also how they are designed, produced, and distributed. Somewhat paradoxically, just as the field of cultural studies is making its material turn, design practice is making a turn of its own—an immaterial turn—focusing less on physical things and more on connections between them. Increasingly, design practice is concerned with nodes and links—networks, systems, and communities of systems. These new concerns have given rise to new disciplines—business design, interaction design, service design, social innovation design, and trans-disciplinary design. Design practice is not so much turning away from things as it is connecting things. Three main types of connections are involved. 1) Organizations are finding that opportunities for creating new value lie primarily in connecting products to services and experiences. 2) Design discourse increasingly recognizes that things are connected to ideas; that artifacts are tied to use, meaning, and context; and that design practice is bound up in language and conversation. And 3) New technologies are connecting things to data networks and complex systems that analyze the data, learn from it, and act on what they learn. The process of connecting things has already begun to broaden design practice from its traditional focus on stand-alone products to also include systems, platforms, and product-service ecologies. Harnessing waterpower and then steam power dramatically increased the speed of the-making-of-things; it turned craft-production into mass-production, and brought about the industrial revolution. The industrial revolution led to unprecedented rates of production, turning more and more things into commodities—things that are essentially the same and differ only on price. At first, when a new thing is manufactured, it’s relatively rare, it commands a relatively high price and thus manufacturers are able to make a profit easily. This situation often tempts other manufacturers to begin making the “same” things, increasing quantities available for purchase. With more goods available, competition increases, and prices fall. Continuing to manufacture more of the “same” things becomes a losing proposition, and in order to survive, businesses have to look elsewhere to find value and difference. Many sectors have gone through this process. Personal computers are a classic example. In 1981, IBM offered its first PC for $1,565 (more than $4,000 in 2015 dollars), featuring a 4.77 MHz processor, 16 KB of RAM, and no hard disk. Its PC line earned billions of dollars and became the industry standard. Nevertheless, twenty-four years later, IBM recognized it could no longer compete and sold its PC business to Lenovo. Today, Lenovo offers a $99 PC featuring a 1.33 GHz processor, 2 GB of RAM, and a 32 GB hard disk2—nearly 300 times faster, with 125,000 times more RAM, and the added benefit of a hard disk, for about 6 percent of the cost of the original IBM PC (less than 3 percent when adjusted for inflation). That’s a once scarce thing becoming a commodity. When products become commodities, manufacturers look for ways to differentiate them—ways to make them unique again. For a time, quality materials, quality manufacturing, and quality product design offered differentiation. As competitors begin to match quality, businesses must look elsewhere for differentiation and value. As the economy has moved from manufacturing to services, products have not disappeared. Instead, services have become a way to deliver products, in part because services are a way to differentiate products and increase their value. GE, for example, builds jet engines and sells aircraft “up-time”—leases for engines and their maintenance that guarantee uninterrupted service. Auto industry experts report that almost 25 percent of new cars are leased.4 Personal computer software used to be sold in shrink-wrapped boxes, but now boxed software is rare. Increasingly, software applications are leased (by Adobe, Autodesk, Microsoft, and many others) rather than sold. Complex hybrids are forming. Services are delivering hardware; hardware is connecting to applications; and applications are connecting to each other—all at increasing speed—giving rise to what John Rheinfrank and Jodi Forlizzi have termed “product-service ecologies.” Forlizzi writes, “networks of products, services, technology, people, and collective and collaborative interaction are generating value for the populations they serve.”6 For example, unlike Samsung MP3 players, iPod was not a stand-alone product; it was an integrated system of hardware, software, networked applications, and content—a dynamic product-service ecology. Apple has cautiously opened its ecology to others, teaming with Nike to extend the iPod system—and more recently publishing its HealthKit, HomeKit, and ResearchKit APIs (Application Programming Interfaces), enabling broader access and turning smart-phones into hubs of body-area networks and home-management networks. Systems thinking is not new to business. Kodak created an early product-service ecology, offering cameras, film, and processing services. Mass-production has long included assembly lines, supply chains, distribution networks, and inventory management systems. Infrastructure—physical networks, such as canals, roads, and telephone lines—have been vital to economic growth. The idea that utility arises through connections may be applied not only to the special class of things that are systems and infrastructure but also to all human-made things. Several critics have suggested that things exist within a complex social-technical-linguistic matrix (a web of relationships connecting people, things, and ideas). For example, Humberto Maturana and Francisco Varela developed the theory of autopoiesis (literally “self-making”—the processes through which living systems create and maintain themselves), later with Niklas Luhmann and others extending the idea to social systems. And Michael Callon, Bruno Latour, and John Law proposed Actor Network Theory (ANT), a method in which artifacts are described as participants in social and semiotic systems. Systems of manufacture and infrastructure have been explicitly designed, refined, and iterated. For a few designers, systems and infrastructure have always been things-to-be-designed—the material of design. Systems and networks can be treated as sets-of-elements and as wholes—just as stand-alone products are often both collections-of-components and wholes. A pot, lid, handle, whistle, and spout, for example, comprise a teapot, which we tend to see as a whole, until one of the parts breaks, thrusting itself into our view. This notion applies to systems of manufacture and infrastructure as well. ANT describes the process of parts forming wholes as punctualization and the process of wholes decomposing into parts as depunctualization. Indeed, mediating between the parts and whole—and the whole and the larger systems in which it is enmeshed—is a key element of what designers have always done. In the mid-nineteenth century, Western economies shifted from an agricultural basis (using human and animal power) to a manufacturing basis (using the power of falling water or steam). Adding power to things increased their value. A lot. As electric power emerged, motors were incorporated into many things, creating “powered” devices—air conditioners, cameras, electric toothbrushes, vacuum cleaners, and washing machines, for example. In the late twentieth century, Western economies began to shift from products to services and from manufacturing work to knowledge work—to an information economy. In part, adding information to things meant incorporating microprocessors—the chips at the core of personal computers—creating “smart” devices. For example, the average car includes at least thirty microprocessors; some luxury cars include as many as 10011. Most new devices that include a motor are now likely to include a microprocessor—air conditioners, cameras, robot vacuum cleaners, smart toothbrushes, and washing machines, for example. The “conversations” that designers have help them learn—whether that means solving problems or facilitating agreement on goals—and then designers embody what they’ve learned in things they make. They connect ideas and things. That is, they add information to things. The process of learning—of adding information to things—can be seen in the evolution of a product. Consider an example from the healthcare industry. The difference between a poison and an antidote is information. A drug is not merely a molecular entity; a drug is chemistry plus knowledge-in-action. In order to bring a drug to market, a producer must document its effectiveness and safety, indications and contra-indications, and potential interactions and other risks. This knowledge must be made explicit in a series of regulated documents—filings, package inserts, product data sheets, instructions for use, and packaging. In addition, the producer must have processes for ensuring quality components and quality manufacturing, and the producer must also have knowledge about stability of the compound and how it needs to be controlled during delivery. Adding code to smart devices is another way to add information. Less obvious is that mechanical devices include code of their own—the gears in a mechanical watch are a sort of program, a pre-defined process. Even less obvious, the product’s form and material represent accumulated knowledge—that is, added information. The product’s very presence in the market likewise attests to knowledge learned—and information added to the network of systems in which any modern product is enmeshed. For most of the twentieth century, design practice focused on artifacts—on giving form to things. Psychologist and designer Steve Wilcox tells of his first job at the venerable Herbst Lazar agency. His design team went to Ford to visit an engineering team; the person ushering them in opened the door and shouted, “The skinners are here.”17 “Skin” referred to the outside of the product—the surface that encloses it. In 2000, Apple CEO Steve Jobs challenged this view of design. Steve Jobs transformed popular perception of design. He connected design with cutting-edge technology and with serious business. He demonstrated that good design could make money. He saved Apple from bankruptcy and went on to create a series of iconic products—and the world’s most valuable company. The business world noticed. Apple became an exemplar—an “existence proof” that design could make a difference in business. Apple’s success opened the door for design thinking—repositioning design from a service that delivered renderings to a business consulting practice that promised innovation. Bruce Nussbaum beat the drums at Business Week. IDEO demonstrated the idea on ABC’s Nightline. Design thinking became so fashionable that the Harvard Business Review ran cover stories. Dean Roger Martin even re-organized the University of Toronto’s Rotman School of Business around design thinking. In a sense, design “dematerialized”. Practice moved, to an extent, from making things to making money (an abstraction) or at least from making things to creating value (another abstraction). Practice likewise shifted focus from drawing things to discovering insights and turning them into innovations, and from form giving to design thinking. Over the last fifty years, these ideas have entered design discourse, and some have seeped into design practice and design education. The contemporary mania for design thinking has also begun to bring these ideas to business. In the process, the designer’s role has expanded from simply making what’s requested to participating in discussions about what should be made. At a recent AIGA conference, the head of design for a large corporation lamented, “The worst part about my job is the politics.” Yet, the designer’s job is, in large part, politics. Design that matters has always been about coming to consensus on what matters—what we wish to conserve—and that’s an essentially political question. Platforms create value by creating opportunities for others to create value. Adding users makes the platform more attractive to developers. More developers mean more “apps.” More apps mean more users, which makes the platform more attractive to developers. Each new user can make the platform more useful to all users. For example, Facebook becomes more interesting as more of your friends join. What platforms really do is create frameworks for cooperation, and in so doing, they speed-up evolution. As things become more connected, they (and the systems in which they are enmeshed) are making it possible for producers and consumers to become more connected. Isolated transactions are giving way to on-going relationships. Even the formerly sharp line between producing and consuming is blurring. In the thing-focused world of stand-alone products, the distinction between producer and consumer was clear, bridged only by a brief transaction—the sale of a thing. Both parties knew where they stood and stayed on their side. In the emerging connected world of product-service ecologies, the distinction between producer and consumer is less clear. Services are co-created at the point of delivery; by definition, services require interaction between provider and user, often over an extended period. Thus, recognizing customers—remembering who they are, past interactions with them, and what they value—is becoming essential to organizations, just as it always has been essential for people to cooperate. Once customers are recognized, relationships become possible. Organizations start to refer to customers as members. At first, this may be mostly aspiration. But the potential exists for membership to grow into a reality—for organizations to engage their members deeply in all aspects of their work. Engaging members—creating spaces in which relationships can grow—becomes a design task, a thing to be designed. These things are sometimes called engagement platforms; more generally, they are platforms for cooperation. Organizations have always been subject to pressure from consumers. Recently, however, some are inverting this relationship, turning their organizations into platforms through which members can engage each other and sometimes work together for social change. The company Patagonia has explicitly embraced these transformations. Patagonia began by designing things, developing a new outlook on climbing gear and outdoor clothing. As the company grew, founder Yvon Chouinard became concerned about his suppliers’ material sourcing and labor practices. He has worked to reform Patagonia’s systems for qualifying vendors—and the vendors’ systems. He’s also shared what he’s learned and worked to reform the apparel industry, developing partnerships, associations, and training and certification programs. Patagonia has also taken strong positions on environmental issues and enlisted the support of its customers.30 More recently, Patagonia has sought to engage its customers through on-line and mobile membership programs, repair services, corporate philanthropy, and sharing stories; some of its programs even encourage members to buy fewer products. The Economist forecasts that by 2020, more than 50 billion devices will connect to the internet.31 That’s quite a gathering of things, people, and information. It will change the economy and social structures, and it will transform design practice. Designing systems, platforms, and product-service ecologies requires us to “connect things”—to think and act in terms of whole systems. Likewise, the problems that really matter—the many wicked problems society faces—require us all to “gather together” and connect people and things, ideas and artifacts, products and services, hardware and software, and thinking and doing. They require us to design relationships—and to design platforms in which others can design relationships. Christopher Alexander, Notes in the Synthesis of Form, (Cambridge: Harvard University Press, 1964). Lenovo website http://shop.lenovo.com/us/en/desktops/#facet-1=1 (accessed December 27, 2015). Kevin Kelly, Out of Control: The New Biology of Machines, Social Systems, and the Economic World, (Reading: Addison-Wesley, 1994), 27. Jodi Forlizzi, unpublished manuscript, via personal correspondence with the author. “Amazon’s Tablet Leads to Its Store,” (The New York Times, September 28, 2011), B1. Ian Hodder, Entangled: An archaeology of the Relationships between Humans and Things, (Wiley, 2012), 7. Gordon Pask, “The Architectural Relevance of Cybernetics,” (Architectural Design, 1969), 494. Tim Misner, “Building Support for Use-Based Design into Hardware Products,” Interactions, (ACM, vol. 16, no. 5, September + October 2009). Kevin Kelly, Out of Control: The New Biology of Machines, Social Systems, and the Economic World, (Reading: Addison-Wesley, 1994), 115. Horst Rittel, The Universe of Design, (a series of lectures given at UC Berkeley in 1963, reprinted by Routledge in 2010). Hugh Dubberly and Shelley Evenson, “Design as Learning—or ‘Knowledge Creation’—the SECI Model,” Interactions, (ACM, Vol. 18, No 1, January + February 2011). Donald Schön, The Reflective Practitioner: How Professionals Think in Action, (Basic Books, 1982). Hugh Dubberly and Paul Pangaro, “Cybernetics and Design: Conversations for Action,” Cybernetics & Human Knowing, (vol. 22, no. 2–3, 2015), 73–82. Personal conversation between the author and Steve Wilcox, July 10, 2015. Liz Sanders, “An evolving map of design practice and design research,” (ACM Interactions, vol. 15, no. 6, November + December 2008). Victor Papanek, Design for the Real World: Human Ecology and Social Change, (New York: Pantheon, 1971), 41. Buckminster Fuller, Ideas and Integrities: A Spontaneous Autobiographical Disclosure, (New York: Macmillan, 1969). James J. Gibson, “The Theory of Affordances,” The Ecological Approach to Visual Perception, Chapter 8, (New York: Psychology Press, 1971). Donald A. Norman, The Psychology of Everyday Things, (New York: Basic Books, 1988), 9. Asle H. Kiran and Peter-Paul Verbeek, “Trusting Our Selves to Technology”, Knowledge, Technology & Policy, (2010) 23:409–27. Personal conversation between the author and an early Google executive. Yvon Chouinard and Vincent Stanley, The Responsible Company, (Ventura, Patagonia Books, 2012). Joi Ito, “Design and Science,” http://www.pubpub.org/pub/designandscience (accessed January 31, 2016). Danny Hillis, “The Age of Digital Entanglement,” Scientific American; September, 2010, vol. 303, issue 3: 93. George Lakoff, “Why Trump?” March 2, 2016, https://georgelakoff.com/2016/03/02/why-trump/#more-4935 (accessed on April 9, 2016). Superb article. Very logically explained. Terrific article Hugh, thank you. Might there be a concept map in the offing on the back of this work?